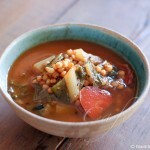 Fresh chickpeas and fresh green wheat — pale green springtime in solid form, infused in a soup of fresh tomatoes. How could you go wrong? These were my finds from the markets of Jerusalem, where unshelled chickpeas are out in abundance. Crispy and fresh tasting, at this stage they’re more similar in taste to fresh peas than they are to their dried cousins; moister and sweeter, they’re also much better than the dried version, if you ask me. In Morocco, fresh chickpeas are considered street food — a street vendor in Fez sold us two bunches of chickpea stalks for a dirham (about 40 agorot). We walked through the streets of the medina happily and obliviously plucking out chickpeas from among the leaves, much to the delight of the local children eating from their own bunches. They’re not sold on streets like that in Israel, which is a pity. In fact, they’re not even sold in every market — I haven’t seen them in Tel Aviv, for instance. Freshly picked, smoked green wheat is an even rarer find, which makes it that much dearer. I didn’t see any at Mahane Yehuda, Jerusalem’s main market, but I did find two vendors near the Damascus gate in the old city. 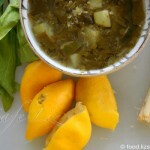 Both these foods are crunchy and green-tasting, wonderful uncooked as snacks and equally wonderful in savory dishes. Credit goes to Ariella for suggesting a tomato soup. I recognize that these ingredients are not readily available to most people — even most people who live in Israel. As alternatives, I’d recommend using fresh peas in place of the chickpeas, and either dried freekeh (to capture the smokiness) or wheat berries in place of the fresh freekeh (green wheat). You could also try substituting sprouted wheat berries — I’d imagine that they too would replicate the texture, though I’ve never had them. Note: I use the time while the tomatoes are simmering in order to peel the chickpeas. Chop onion. Put a thick-bottomed pot on a medium flame and toss in the onion. I recently learned that you can fry onion without any oil whatsoever until the onion loses most of its liquid; add the oil only once the onion begins to brown around the edges. Frying without oil at first is supposed to give it more flavor. Crush garlic and toss into pot with the onion; let brown. Chop the squash and tomatoes and add, too. Let the mix simmer, mixing occasionally, until the tomatoes are falling apart. Meanwhile, rinse the wheat well and pick through to remove any grime (I add it handful by handful to the pot so that I can make sure there are no stray stones in it). Shell the chickpeas — I do this while the tomatoes stew, it takes me about 15 minutes, which is just enough time. When done cooking, toss in the chopped parsley and serve. More on chickpeas and green wheat: Ariella tosses hers into a salad. 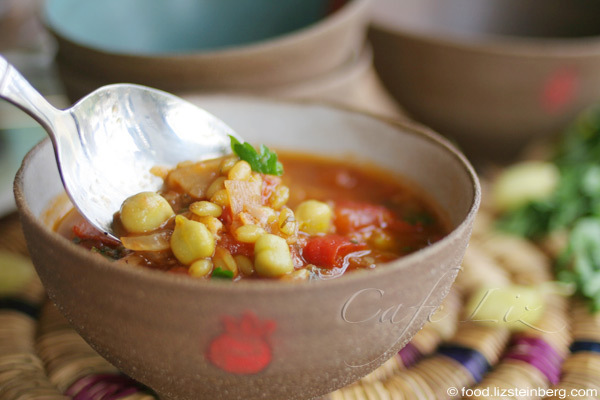 7 Responses to "Tomato soup with fresh chickpeas and smoked wheat"
I would love to taste fresh freekeh,have never seen it.Fresh chickpeas I had when I lived in the north. A lovely soup Liz! 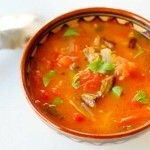 Wow “Tomato soup with fresh chickpeas and smoked wheat” now that sounds like a good hearty meal:)Thanks for the recipe. 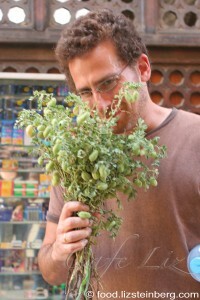 green chickpeas can be found both in Ramle and Mahane Yehuda, but not on the stalk. I saw it sold like that in Jordan. Did not see any green freekeh in Ramle souk, perhaps its available in Nazareth or Akko. 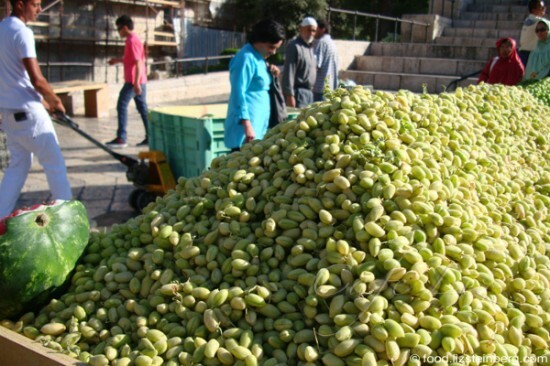 I was in Wadi Nisnas shouk in Haifa last week – saw green chickpeas on the stalk there. Too bulky to bring home across the country by bus, but tasted a few raw, and they were tasty. As Liz says, like fresh peas. Mimi, too bad you didn’t bring them back home! It would have been awkward but worth it. Good to know you can get them in Haifa. Interesting …. the chickpeas make excellent street food. I’m sure that our team of bloggers can find every market in the country that sells these foods.